29LT Zarid Text type family consists of 8 styles: 4 Standard styles and 4 Slanted styles, covering the following weights: Light, Regular, Medium, and Bold. The range of weights provide suitable typographic hierarchical solutions in bi-script Arabic and Latin layouts. Zarid Text is the lucid neo-calligraphic version of Zarid Serif after numerous design and technical modifications were executed on the latter. Improved legibility in small point size and habitual appearance are its key characteristics. Its purpose revolves around continuous reading and aims to be friendly to the reader’s eyes in conventional typesetting; hence making it ideal for diverse editorial typographic layouts such as newspapers, magazines, and books in digital and print applications. 29LT Zarid Text 8 Styles:  Light,  Light Slanted,  Regular,  Slanted,  Medium,  Medium Slanted,  Bold, and  Bold Slanted. 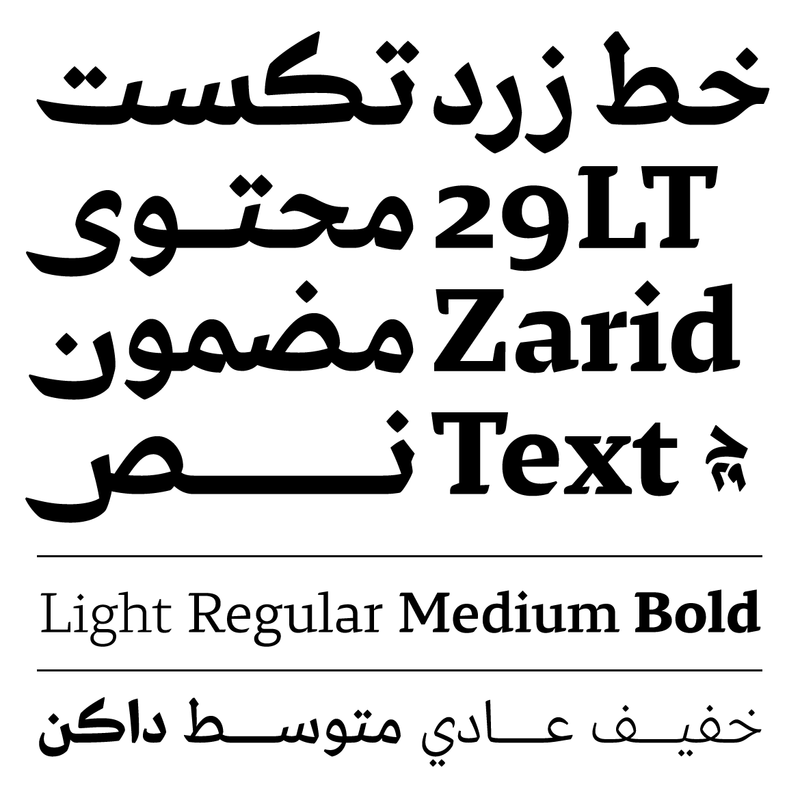 Zarid Text is the third inline family member within the 29LT Zarid super family ongoing development. It is designed to focus on legibility at small sizes amongst having a fashionable feel which makes it aesthetically functional in display typographic setting. The upright and slanted Arabic character set of the type family is designed by Pascal Zoghbi. The upright Latin is designed by Ramiro Espinoza and the slanted Latin is designed by Jan Fromm. The typeface includes advanced typographic features (ligatures, alternates and stylistic sets) that improve legibility and give diverse typesetting options. The fonts cover all Middle Eastern, North African, Eastern European, Central European, Western European, and North and South American Languages. The number of glyphs per font is 1500+. While Zarid Serif is categorized as a formal, confident, and robust typeface, Zarid Text is identified as having clear legible letterforms amongst deeper roots in calligraphy, which makes it associate with familiar reading typefaces. The Arabic Naskh Mastari becomes neo-calligraphic Naskh, whilst the Latin wedged serif becomes a humanistic calligraphic serif. The two distinct scripts agreeably coexist in look and feel, although each one of them retains its’ own structure and characteristics. In the Latin script, the serifs are softened and drawn in a fluent asymmetrical calligraphic aspect that complements the natural flow of reading. The ascenders are shortened in order to make them balanced with the capitals and the median forms of the typeface, lending the fonts a compact vertical presence. With the lower vertical heights, the x-height is optically increased and several counters are opened, per example the ones of the letters a, b, g, n, o, p etc.. The glyphs contrast is increased and the weight balance is adjusted. The spacing and horizontal proportions are widened, specifically in the Regular weight, giving the Latin a coherent color in paragraph setting. Diverse additional micro amendments were made to achieve better consistency, such as diacritics shape and positioning, along with revised ligatures that blend into the texture of a running text. Compared to Zarid Text, Zarid Serif has a stronger and more compact appearance with angular and sharp features. In the Arabic script, the design succession from Zarid Serif to Zarid Text resulted in an overall change in the appearance and style of the Arabic character set. The addition of conventional calligraphic aspects, stronger influence of the qalam (broad nib), to the glyphs didn’t simply entitle an increase in contrast but a total design change. The writing angle of the qalam became dominant in the outline structure of the letterforms and altered several aspects in Zarid Text in comparison to Zarid Serif. The major design differences can clearly be perceived in: 1. the vertical starting pen stroke of the teeth structures as in the Ba’, Kaf, Tah, and Lam; 2. the pen links between the main body structures of the letters and the baseline horizontal stroke as in the Ba’, Seen, Dal, Sad, Fa’, etc. ; 3. the pen links between the heads or arms of certain letters with the tails or bowls like in the Ra’, Qaf, Lam, Noon, etc. ; 4. the finials, endings, and terminals forms such as in the Hamza, Ha’, Dal, Ain, Meem, Ya’, etc. ; 5. the smoothening and rounding of the diacritic dots; and 6. the complete change of glyphs outlines such as in the Ha’, Seen, Sad, Tah, Ain, Kaf, etc. ; besides many other design modifications in order to make the Arabic script seem dearer to the common Arabic reader’s eyes. 29LT Zarid Text Arabic in white (neo-calligraphic Naskh) V/S 29LT Zarid Serif Arabic in black (Naskh Mastari). 6. the complete change of glyphs outlines such as in the Ha’, Seen, Sad, Tah, Ain, Kaf, etc. ; besides many other design modifications in order to make the Arabic script seem dearer to the common Arabic reader’s eyes. Alongside outlines overhauling, the width and height of the letters were reconsidered and the spacing and kerning adjusted. On the horizontal axes, particular letters gained width to permit normal proportions in comparison to a partial condensed letters proportions in Zarid Serif. On the vertical axes, the ascenders and the descenders are shortened to allow for a more compact vertical structure with a balanced weight distribution between the main body parts of the letters and their ascenders and descenders pen components. Both of the horizontal and vertical axes adjustments led to a brighter spacing in the words, sentence structures, and an ampler leading (interlinear spacing) giving a lighter texture to the paragraphs settings. Beside spacing adjustments, the kerning was revisited and additional kerning pairs where added to ensure a clear and structured spacing of letters and words in small typeset sizes. The slanted styles are redrawn based on fast hand-gestures and not merely slanted from the standard fonts. The stems are slanted while the counters are round and smooth. In the Arabic character set, the terminals are curvy with open-ended bowls and smooth baseline links. They are a set of free-spirited styles that can accompany the standard set for a change of text tone, or may stand alone as a casual copy text or delightful display text. The slanted styles in the Latin script are the cursive set of fonts that is known as “true-italics” which are based on a stylized form of quick calligraphic handwriting. The name “slanted” was adopted instead of “italic” for the inclined styles because in Arabic typography and calligraphy the term, italic, does not exist. The design approach, with open counters, clean terminals/finials, balanced weight and high contrast, are all elements that bring the Arabic and Latin scripts together. No surprise, both scripts were created in synergy and were inspired from each other simultaneously. The neo-calligraphic Naskh style in the Arabic script is complemented by a calligraphic Serif Latin, inspired by the broad nip pen writing technique. During the work on Zarid Text, both Zoghbi and Espinoza continuously compared the Text with the Serif styles, set Latin text next to Arabic text and vice versa. They took special care in equalizing the proportion, weight, and letter spacing throughout the different scripts, to gain a consistent and harmonious result. Beside creating Zarid Text, some minor and other major design and technical decisions were taken to be implemented on Zarid Serif by updating it to be more harmonious with the growing type family members. The goal is to expand the Zarid super family, to make all of its fonts work seamlessly together. For reading more about the other 29LT Zarid Typefaces, please refer to the main page on the blog and then select the desired article. When a tooth-letter is proceeded and succeeded by another tooth-letter, it is raised for increased legibility.